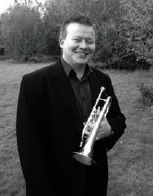 VANGUARD is an exciting solo CD from Iain Culross, principal cornet player of Leyland Band. The album contains many new works recorded for the first time, as well as a number of well loved favourites.This page attempts to provide more information about the people involved in making “Vanguard”, including the performers involved. Use the buttons above to visit the Vanguard Home page if you’d like listen to samples of the tracks or order a copy for delivery – alternatively, the Digital Downloads button takes you to a page where you can purchase MP3 or WMA versions for immediate download. Iain Culross was born in 1986 in Dundee, Scotland into a large musical family, which best explains why making music was all that he wanted to do from an early age. Iain started learning trumpet at school aged seven, but found progress in the school system was rather slow. It wasn’t until joining his local brass band (Dundee Instrumental) on cornet at the age of ten and also mum arranging for him to have private individual lessons, that things started to move at a pace more to Iain’s liking! Inspired by some tuition from Roger Webster (which dad had arranged as a result of Iain winning the British Open Junior Slow Championships at age eleven), by age twelve, Iain had been promoted to principal cornet, a position he later went on to hold with several of Scotland’s top bands (including the National Youth Brass Band of Scotland). Many solo competitions were won along the way as well as acquiring two Trinity College diplomas before the age of eighteen, when Iain took the advice of teacher David James and moved south to study music at the University of Salford, where his playing really began to blossom. Since then Iain has held positions as principal cornet with many of the UK’s leading brass bands including his current seat with the world renowned Leyland Band. He has enjoyed many successful contest and concert performances, and is fast establishing a reputation as one of the finest cornet soloists of his generation, performing, adjudicating and giving master-classes as far afield as the USA, Denmark, the Netherlands, and Japan. In 2009 Iain was the recipient of a prestigious Dewar Arts award, awarded for performance in trumpet. This award allowed him to complete his postgraduate studies at Salford, graduating with an MA in Music (performance) in 2010. Iain is now a cornet tutor at the University of Salford where he is also undertaking research into focal dystonia in musicians, working towards a PhD. RUSSELL GRAY – born in Scotland in 1968, Russell Gray is widely regarded as one of the finest cornet soloists and conductors in the world. His playing career took off whilst studying music at Huddersfield University, playing for Black Dyke Mills Band and Brittania Building Society Band, before spending eight years as principal cornet with Leyland Band, leading them through one of the most successful periods in their history. Russell then started his conducting career in 1998 with the Stavanger Brass Band in Norway, and since then Russell has won many competitions, including the Norwegian, Danish, Japanese, Scottish, and British National Brass Band Championships, English National Championships, and the Grand Shield. Aside from brass bands, Russell also enjoys working with many varied ensembles. These include the National youth band of Switzerland, the Queensland Youth Band, the Australian Army Band Brisbane, Her Majesty’s band of the Coldstream Guards, Wrexham Symphony Orchestra, the Queensland Pops Orchestra, the Mueller International Chamber Orchestra, and the Cambrian Orchestra at St Giles. In 2007 Russell was appointed Adjunct Professor at the Queensland Conservatorium of Music in Australia, at the same time completing a Master’s Degree in orchestral conducting at the Royal Scottish Academy of Music and Drama where he worked with many of the leading orchestral conductors from around the world as well as the Royal Scottish National Orchestra. LEIGH BAKER – Leigh hails from Melton Mowbray in Leicestershire but moved to Yorkshire to study music at the age of 18. He is composer in Residence at the Brighouse and Rastrick Band and served the band for 19 years, primarily on Solo Baritone until his playing retirement in 2009. Leigh is a highly published writer for brass band having composed and arranged for many groups including Brighouse and Rastrick, Grimethorpe Colliery, Desford Colliery, Leyland and Flowers. He has won numerous awards for his music (including ‘Best New Composition’ at Brass in Concert on 2 occasions) and his works have been selected as Test Pieces at competitions including The National Finals. Leigh has conducted a wide range of ensembles, most recently achieving success with the South Yorkshire Police Band and was recently appointed to the role of Musical Director with Leyland Band, and was instrumental in preparing the band for its victories at Brass in Concert 2011 and the North West Regionals 2012. LEYLAND BAND – Established in 1946 as the Leyland Motors Band, the Leyland Band is one of the most successful brass bands of the last 30 years. Leyland was crowned British Open Champion in 1994, and has been three times All England Masters Champion. In 2005 the band became the Champion Band of Great Britain for the first time, and earned the right to represent England at the 2006 European Brass Band Championships. The band has an enviable record at the North West Area Championships having won 9 titles in 30 years, including the most recent event in 2012. Leyland has also won the Brass in Concert Championships five times, and is the reigning champion, which reinforces the band’s first class reputation on the concert platform. Leyland have performed at many prestigious venues including the Royal Albert Hall, Belfast’s Waterfront Hall, Symphony Hall Birmingham and the Bridgewater Hall, as well as having toured extensively abroad, visiting Japan twice, the USA four times, South Korea, Norway and all the major European countries on numerous occasions. Other facts: “Vanguard” was recorded at Darwin Lecture Theatre, University of Central Lancashire, on Saturday 19th and Sunday 20th May 2012 by World of Sound. It was produced by Brian Hillson and engineered by Fergus Murphy and the CD artwork was created by Iain’s sister Sarah Culross. Iain’s cornet is a Willson 460 Celebration model.